Scallops and Nudis and Tigers, Oh My! Club member Steve Lodge and I staged a boat dive in the San Juan Islands to Sucia Island, my home-away-from-home, over the weekend. There were 5 divers from our club, 3 on my sailboat "Maggie May" (myself, Jim McGaughey and Carl Baird), and Paul Riggs and Steve on his powerboat "Makushla". We met up Friday, spent a bouncy night at anchor, and then moved around to the other side of the island to Fox Cove and found a mooring there. Steve and Paul tried doing a dive to find some crab to no avail. We transferred 10 tons of dive gear to Steve's boat and motored around to the north side of the island and dove Lawson Bluff and then Ewing Island. Weather was gorgeous - in upper 70's and sunny. There are nice walls and ledges with large boulders that have fallen off the sandstone bluffs above on these sites. 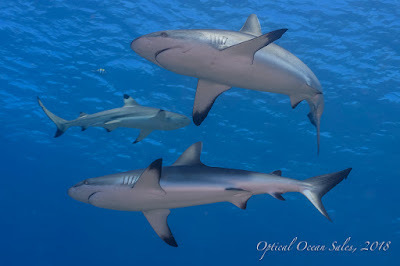 We tended to have fairly square dive profiles, but not overly deep at around 55-80 feet. I dove on 32% EAN, that gave me long bottom times on my steel 98. Lots and lots of schools of fish, from small Puget Sound Rockfish, Quillback Rockfish in every size, Kelp Greenlings, large Ling Cod and so forth. Unfortunately the viz was so-so, maybe 15', so they were hard to shoot. Currents were light. Photography-wise it was up and down for me. 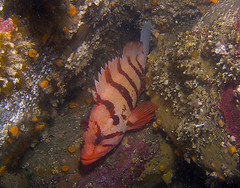 I shot a couple of rare nudis not found south of the islands, and shot a Tiger Rockfish, also a rare and timid species. BUT I made a major mistake when switching into RAW mode I forgot to change the ISO back to 80 from the default 200. This is one feature I've stumbled over before on my Fuji F810, it takes two places to change back and forth from RAW and you have to remember to change the ISO back. So the photos are pretty grainy. Dimwitted at 70'. I also managed to create a fog inside my case when shooting hard towards the end of the second dive. I forgot to add in silica gel packs, maybe got a tiny bit of water when changing batteries. Had a great dinner Sat. On Sunday Steve, Paul and Jim went out on Jim's RIB dingy to do another drift dive with Carl doing surface support. I stayed back on the boat and made a huge brunch for everyone. Although overcast, we had a calm passage back to Blaine, got back to the dock, and had most of the boat unloaded before the rain deluged us. Jim had had some car problems towing his boat up, so his wife met them to take the boat in tow, so Jim could limp home. So win some, loose some, great weekend, we're going again in two weeks. Practice makes perfect!